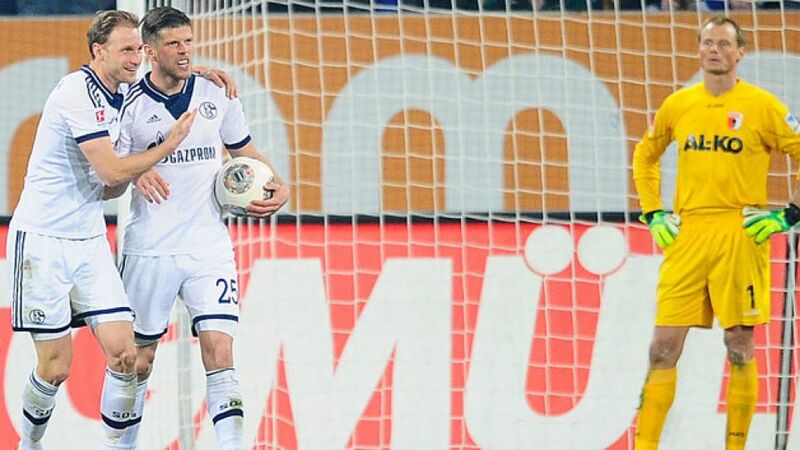 Augsburg - In a team that finished Friday night’s 2-1 win at FC Augsburg with four players under the age of 21, 30-year-old Klaas-Jan Huntelaar is the veteran at FC Schalke 04 these days. The Dutchman is also the man the club turn to when it matters most. Absent for large parts of the season, the forward's return to the side this year has coincided with six wins from the team’s last eight games, while Huntelaar has now notched seven times in his last eight outings following his brace at the SGL Arena. The Ghanaian’s words could not have been more accurate, as Huntelaar netted with two predatory close-range finishes to reward a mediocre Schalke performance with precious points in the race for UEFA Champions League qualification and take another step in banishing the demons of heavy recent defeats to FC Bayern München and Real Madrid CF. Such is the strength of teams used to competing in the upper reaches of the table, however: the Royal Blues were able to make their few chances count to take maximum points without being at their best, a trait that certainly bodes well for the rest of the season. Jens Keller’s side now travel to Madrid next week with little more than an outside chance of overturning a 6-1 deficit against the nine-time European champions. While the tie itself looks all but done and dusted, Huntelaar insisted there was plenty to keep the players motivated. He called on Schalke’s youthful side to embrace the occasion, whilst remaining confident that their maturing outfit can secure more top-level European football next season. “Real Madrid are one of the best teams in the world, we saw that in the first match," said Huntelaar. "But what we have to do is focus on our game and try to do a good job. Regardless of the result, the tie has been a good lesson for us. We have a young team and in the four years I’ve been here, we’ve been in the Champions League every year except for one. Madrid are a world-class side but we have to enjoy it.” With the striker in this kind of goalscoring form, there is every chance of that happening.